The Wyss Institute for Biologically Inspired Engineering at Harvard University has won second and third place prizes in the “Research Showcase — Poster Session” at the 2012 Massachusetts Life Sciences Innovation Day held May 31 in Boston. The two Wyss research advances honored were a non-thrombogenic, anti-biofilm surface for medical devices and the Institute’s Organ-on-Chip Technologies. Developed by the Massachusetts Life Sciences Start-up Initiative (MALSI), this annual conference brings together scientific leaders, business experts, academics, policy makers, entrepreneurs, and venture capitalists dedicated to maintaining the state’s position as a world leader in nurturing life sciences companies. The conference’s “Research Showcase — Poster Session” spotlights some of the area’s best fundamental research advances in biotech, medtech, and medical devices, helping set the direction for where these industries could go in the future. 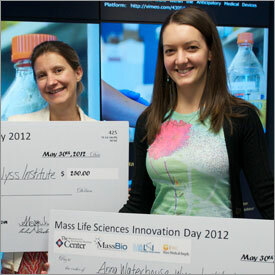 Geraldine Hamilton and Anna Waterhouse presented Wyss Institute research that won third place and second place, respectively. This year, conference participants voted for five finalists from a pool of candidate posters detailing a diverse range of innovations. A team of seasoned investment and start-up professionals selected the winner from this group of finalists. The Wyss novel surface material that received second place in the competition is based on the Institute’s SLIPS (Slippery Liquid Infused Porous Surfaces) technology, a discovery that was recently published in Nature. This surface repels liquids, cells, and pathogens for use in indwelling and implanted medical devices with high rates of thrombosis and infection due to biofilm formation. These complications are extremely detrimental to patient outcomes, often fatal, and represent an enormous economic burden on the healthcare system. The Wyss Institute’s Postdoctoral Fellow Anna Waterhouse presented the work described in the poster, which was carried out by a team of collaborators that included Waterhouse, Ben Hatton, Dan Leslie, Tak-Sing Wong, Phil Kim, Julia Berthet, James Weaver, Alex Epstein, Elana Super, Alex Watters, Mike Super, Joanna Aizenberg, and Don Ingber. The Organ-on-Chip technology, which received third place in the competition, are bioengineered microfluidic-based human organ mimics that have been shown to exhibit integrated human organ-level functions, such as lung inflammation, absorption and toxicity of nanomaterials, the ability to maintain barrier function and co-culture gut epithelial cells with gut microbiome, renal transport of drugs and renal toxicity, cardiac contractility and response to cardioactive agents, as well as the engineering of a functional bone marrow in vitro. Geraldine Hamilton, a member of the Wyss InstituteÍs Advanced Technology team, presented the poster entitled “Organ-on-Chip Technologies: Transforming Drug Discovery.” The work described in the poster was carried out by a team of collaborators that included Hamilton, Dan Huh, Hyun Jung Kim, Anthony Bahinski, and Don Ingber.